September 2, 2014 - Another flight diverted over a reclining seat. On Monday a Delta flight from New York City to West Palm Beach, Flight 2370 was diverted to Jacksonville, as a result of two passengers getting into a heated argument which lead one of the passengers involved to state to the flight crew, "I don't care about the consequences, put this plane down now." For the third time in a little over a week, a commercial flight has been diverted over passengers fighting over a reclining seat. At about 9 PM passengers onboard the Airbus A319 were told the aircraft was being diverted to Jacksonville. This came after two passengers got into an heated argument, one passenger had fallen asleep onto her tray table, at some point the passenger in front attempted to recline her seat, at which point the rear passenger expressed her anger. A witness to the event said the passenger in the front was knitting, afterwards she then reclined her seat and the women in the back started screaming and swearing. At which point a flight attendant tried to defuse the situation, that's when the rear passenger began swearing at the attendant and demanded the flight land, "I don't care about the consequences, put this plane down now." At which point the flight attendant contacted the pilot. Within a few minutes later the pilot announced over the intercom that the flight would be diverted to Jacksonville. Upon landing the women was taken off the plane and arrested. 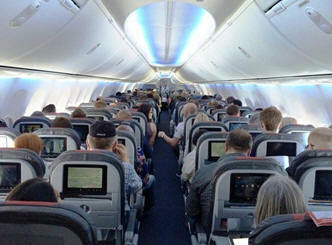 A Delta spokesperson said Flight 2370 was diverted "due to safety reasons in regard to a passenger. On August 24, a United Airlines flight, Flight 1462 from Newark to Denver was diverted after a passenger used a device called a "knee defender" to stop the person in front of him from reclining his seat while he used his laptop on the tray table. 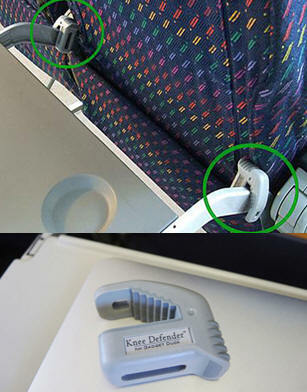 Knee Defender ($22) is a device that passengers can purchase online, it is used to lock and prevent the passenger in front of you from reclining the seat back and hitting your knee. When the airlines shortened the leg room between passengers, advertised to passengers its ok to bring your laptop onboard and in the same breath told passengers to enjoy the flight and recline your seat, your going to have these kinds problems. Should a passenger who is told they can use their laptop or recline their seat be subjected to an invasion of their space and should they have to defend it the airlines respociblility? What is the cost in fuel and delays when a pilot diverts an aircraft? What about the inconveniences to passengers with connecting flights and so on. What trainings have pilots and flight crews received in handling these kinds of situations? Is diverting the aircraft the answer and are pilots and flight crews to quick to land the aircraft when there are problems onboard? Is this a passenger problem or an airline problem? You would think given the cost to the airlines that this problem would have been put to bed. In the case of the "knee defender" Qantas and Virgin Australia airlines have made it clear, in released statements both carriers indicated that the use of such a device is banned on their aircraft. "The safety and comfort of our guests remains our highest priority".